Internet hosting giant Tucows is planning on launching its very own wireless carrier at some point in 2012. Named Ting, the service will be available throughout the U.S. and will ride on Sprint's network. Now, before you start asking yourself whether we really need another carrier or not, you might want to know what tricks Ting has up its sleeve. 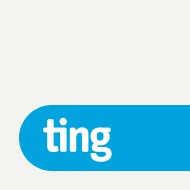 Instead of being charged overage fees, Ting subscribers will have their monthly plan's tier automatically switched based on their usage. For example, if a customer happens to use more minutes, texts, or data than the current tier offers, the tier will be changed automatically to the next one available. And that works the other way around too – those who use less than they pay for will have their tier switched to a cheaper one, if possible. On top of all that, Ting will require no long-term commitment, meaning that you will be able to upgrade to a new phone or change your carrier without much trouble. Some might find it a bit disappointing, however, that there are no plans for brick and mortar Ting outlets, so purchasing a device will be possible solely online. Furthermore, there might not be a whole lot of phones available at first, and since there will be no carrier subsidy, some might find handset prices rather steep. The HTC Detail, for example, which is a variant of the HTC EVO Shift 4G, will retail for about $495. On the bright side, Ting promises that the iPhone will be available, albeit not at launch. So, what do you guys think of Ting? Does it have what it takes to pick up traction or will it simply fade away unremembered? Feel free to share your thoughts with us in the comments. Like the idea... wish it was not stuck on Sprint, though... might even be too good of a deal to be allowed to continue operations (by consensus of the other carriers, who will probably hate it). The concept, though, is very nice. If I had money, I might try to get a phone from them. I wonder if they will be able to flash other CDMA models to work on their service, like MetroPCS does? Its a love Hate idea. Good try, but Alltel has been doing the same thing with their phones for a few weeks now and their flexible payment plans are pretty respectable. The area where Alltel has advantages are in the coverage. I don't know the plan rates for TIng yet. LOL, Alltel is still on the map. It has just been turned into a simplified version of Verizon. It has Verizon's older android phones and is selling them at ridiculously low prices, even the unlocked variants are fairly low priced. I have never lived in an Alltel market, ever. Even before Verizon bought them out, and allowed the remnant to operate under the Alltel name, I had hoped they would arrive in my region, but they never did. Ting could be the only possibility for such a thing out my way. With all that they got coming down the pipe.. You are going to see SO MANY PEOPLE FLOCK TO THIS PLAN. Good point. We're on Sprint, and flashing an existing phone would make this attractive. is that like gsm or cdma? its sprint, so CDMA. You know, if the plans are cheap enough, and it roams on sprint's entire network and not some limited version of it.. it could be a killer deal. The trick is.. for me at least.. can it compete with Tmobile's $30 unlimted 4G text/web plan with 100 mins. If i didnt work for the carrier, thats the plan I'd be on. CDMA. SPRINT RUNS CDMA. TMOBILE AND ATT RUN GSM. It doesnt come with TRULY UNLIMITED KNOW YOUR STUFF.. t MOBILE throttles you which doesnt allow you to have truly unlimited speeds. When throttled it takes 15 to 20 minutes to watch a 5 minute youtube video. Sprint at 1 gb or 10 gb the videos take a third of the time compared to T mobiles throttling and thats at maximum capacity on the network..
yea, it throttles after 2 gigs of usage which covers 90-95% of users with more than enough. The average data bill is well less than 1 gig. Besides, ONLY sprint does truely unlimted and its 100 a month, not quite in the same category, eh? Also, if you want to compare non-prepaid plans, TMobile offeres a 2 gig plann , a 5 gig plan and a 10 gig plan before throttling.. both the 2 and 5 gig plans are WAY less than sprints $100 unlimited plan. The 10 gig plan is the same prce. almost no one needs 5 gigs, and even less use 10 gigs.. but hey, you keep over paying for slower just so you can say its truely unlimited. if your not using more than 10 gigs, your just waisting your money. Sprints truly unlimted plan is also not truly unlimited if you read the fine print. If you are roaming you only get 300mbs a month and if you look at there data coverage map there are a lot of areas where you roam unless you live in major cities or just happen to be lucky. For me Id have to check that Im not roaming everytime I use the phone. You mean T-mobile got rid of their "slow you down to 2G after 2 gigs in a month" News to me. I mean thats not a weird usage restriction or anything. No zay zay. The throttling I referred to was considering the 2gb throttling.. Lol.. T mobile is such a rip off..
A lot of you guys stay downing sprint but have no valid reasons other than some coverage issues that will be panned out by 2012. Sprint will cover the entire nation in one year with LTE (3 - 21 mbps) plus they have the wimax network (3 - 6 mbps) to fall back on until 2015. I live in Columbia, SC .....Sprint's 7 billion dollar network upgrade puts them back in the driver seat when it comes to utilizing the customer base and giving the most affordable prices. We are not out of the recession fully and a lot of people still have to watch there pockets. Why not save 2000 to 3000 dollars every two years over the competition and help a company that appreciates you in the process. Sprint is the Future, Hello Ting. Welcome to the NOW network. That's because you dont actually have sprint coverage in your area, you have roaming. So let me see if I understand this. The way a tier works. Ill make examples since there arent any yet. If tier one is 40 a month for 450 and tier 2 is 60 for 900 mins. Then if I go over 450 mins instead of paying overage per min I automatically get bumped to the 60 dollad plan for 900. This seems like a rip off to me. Most people are going to try and stay under teh 450 so they can keep there bill cheap and if they go over itll be by a min or two. So instead of paying a extra 45 cents for talking 451 mins I will be charge an extra 20 bucks. Def not a good idea to me Ill stay on my regular plan with any company. They automatically bump you down too on months you dont use the phone much. More or less it sounds like a pay as you go service that automatically adjusts itself, good for someone that doesnt want to count their minutes and has varying usage.